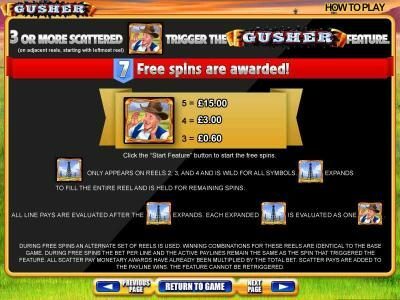 Gusher online slot machine pictures and slot feature list from WMS, play Gusher Slots for free. Gusher Slots has not been reviewed yet, be the first to rate this slot. Gusher, a wms slot that gives the player 5 reels and 30 lines to play on, offers a top jackpot which is worth up to $10,000 and has scatters and wild symbols as its main features. 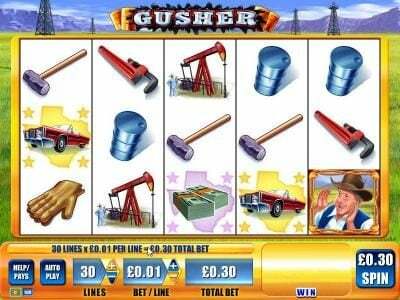 Gusher’s theme is one that you will not see too often in the world of Slots, focusing on oil rigs and the life of those that do this kind of job. It’s a bit focused on the oil rigs that grace the Texan landscape as far as I can tell. The oil fields are seen at the top of the screen, with the reels being all white. The design is fairly attractive and the player gets most of the details he needs. 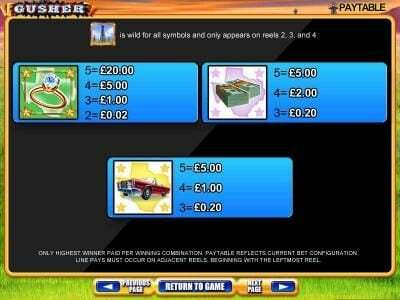 Among the symbols that you will find on the reels of this game there is the Texan man with the big hat, the diamond ring, stacks of cash, the convertible American classic car, the oil rig, the oil barrels, gloves, hammers and other tools. Each payline available in Gusher requires only one coin in order for the bet to activate it. There isn’t much of an option here, since the game requires for 30 coins to be used and for all paylines to be active. Each coin is in the range of $0.01 to $5, with the betting range of the Slot being $0.30 to $150. The top payout gives the player 2000 coins, which may have a value of up to $10,000. A symbol with a diamond ring is going to award the player the top payout of the game, 2000 coins. The player will need five identical symbols and wild symbols may help with the formation of this combo. The wild symbol of the game is going to appear on three of the five reels, the ones from the middle. It gives us a drilling rig image and as a wild it is capable of substituting for other symbols. The symbol which shows us the Texan man acts as a scatter symbol. Whenever the player gets a minimum of three symbols of this type, in scatter positions but starting from the reel from the left and in consecutive order, a feature called Gusher is started. 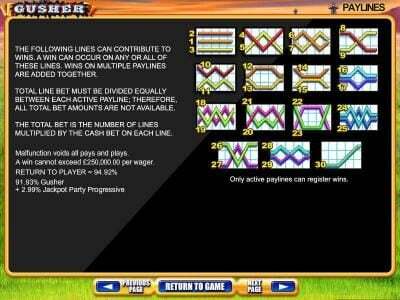 During this feature the player receives 7 free games and he also gets a payout. 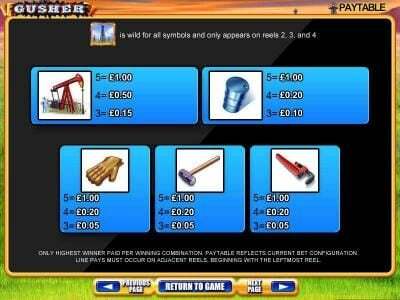 During the Free Spins the drilling rig wild will expand and will cover the reel it is on, after which it will remain there for the duration of the free spins. It’s a decent game with an innovative theme and it should be worth trying out just for that.